It seemed to me nothing so much as a cross between an end-of-term party and a giant scalextric tournament. With real cars. That said, it was quite some line-up for an end-of-term party. A seven-times F1 world champion, a five-times World Rally champion, a three times World Touring Car Champion and a double World Superbikes Champion. Oh, and a couple more Grand Prix winners, another touring car champion, the youngest ever F3 champion and an eight times Le Mans winner. Michael Schumacher, Sebastien Loeb, Andy Priaulx, Troy Bayliss and Tom Kristensen, as well as double Race of Champions winner Matthias Ekstrom were all at Wembley to go up against each other last weekend. Quite a line-up for any racing event really - it's just a shame that Lewis Hamilton wasn't going up against Michael Schumacher - rumour has it that Mclaren put the kybosh on that one. The Race of Champions, the brainchild of former World Rally front-runner Michele Mouton, started out life in the late 80s as an end of season party for the world's leading rally drivers. Over the last few years, though, it has moved first to the Stade de France and latterly to the new Wembley Stadium, with the the world's leading circuit racers joining the rally boys. For all that it is effectively a rally super-special stage, the circuit racers haven't done badly over the years. Heikki Kovalainen first came to our attention by beating Michael Schumacher around the temporary course at the Stade de France in 2004 and all-rounder Mattias Ekstrom (first and foremost a touring car driver, but not without a fair amount of rally experience) winning in 2006 and 2007. This year saw the revenge of the rally boys, with Sebastien Loeb triumphing over David Coulthard in the final (the Scot seemingly still unable to stay out of trouble this year, twice hitting the barriers in his ROC buggy (only narrowly scraping through into the final after wiping out his front wheel at the very last corner in his battle with NASCAR front-runner Carl Edwards in the semi, and getting himself tangled in the temporary barriers while demonstrating his Red Bull in the break!). The whole thing was broadcast live over the internet thanks to Freecaster.tv . The idea of webcasting race series currently only available on obscure satellite channels, incidentally, is one I seriously think race series organisers should consider. I'd be far more inclined to pay a subscription to watch a race series via a good quality internet service than to pay for Rupert Murdoch's satellite TV service. All in all, it sounds like a great idea. Sadly, I must say I found the actual event a little underwhelming, and if I hadn't been rather at a loose end that Sunday afternoon (the weather really isn't up to much here) I probably wouldn't have stuck with it - despite John Hindhaugh and Bruce Jones' very enjoyable commentary. The fundamental problem is that watching drivers battling only against the clock, without any 'wheel to wheel' action isn't all that exciting. The rally world gets away with it because a 300BHP WRC car being hustled down a muddy forest track is spectacular in a way that a Fiat 500 Abarth being driven against the clock round a ludicrously tight track within the confines of a football stadium just isn't. To steal a line first used by Nelson Piquet to describe the Monaco Grand Prix, it's like trying to ride a bicycle in your living room. Nonetheless, I do think there is mileage in the idea of gathering together the top performers from across the racing world to put on a show in a major European city come December. Despite my reservations about the event itself as a spectacle, I was quite tempted to go to Race of Champions myself. For a start, while there's little to do in the environs of Silverstone, Brands Hatch or Donington, a visit to RoC can be combined with a long weekend in London - a rather appealing idea at this time of year. As it happened, work intervened and I couldn't get away for long enough to make the trip. It strikes me that a football stadium, once given the tarmac treatment, would be an absolutely ideal venue for a karting tournament. Such an event would enable more drivers on track at any one time, and, providing the karts were quick enough, would almost certainly make for a better spectacle than the current rally super-special derived format does. OK, so it might tip the balance away from the rally drivers and towards the circuit racers, but Sebastien Loeb aside, the rallying world is rather short of real stars these days, and I can't help but think that - after his impressive showings in a Red Bull F1 car last month, the Frenchman would hardly be intimidated by the thought of going up against Schumacher et al in karts! Labels: "race of champions" "wembley stadium" "david coulthard" "sebastien loeb" "michael schumacher"
First up, a grey and dreary day at Silverstone for the opening round of the FIA GT Series. Broadcast live thanks to ITV4 (a shame they didn't keep that up for the whole season), it was the best GT race I've seen in a long time. GT racing can be intriguing, and the cars look wonderful, but one thing it doesn't usually produce is thrilling, wheel-to-wheel racing with multiple contenders for victory. This time, the weather helped to ensure it did. The Corvette C6 of Marcel Fassler and Jean-Denis Deletraz had disappeared into the distance in the early stages, but series newcomers Gigawave managed to bring their Peter/Simonsen Aston Martin into contention by relying on a one-stop strategy as the rain improved their fuel consumption just enough to enable them to pull it off. In the end, on worn tyres, Phillip Peter couldn't hold on long enough to win, and with the C6R having fallen a long way off the pace with ex-F1 no-hoper Deletraz at the wheel, the final laps were fought out between the Maserati of Michael Bartels and Andrea Bertolini and the eventual winner, the JetAlliance Aston of Karl Wendlinger and Ryan Sharp. Unusually for a GT race, it had me transfixed from start to finish. Motor racing isn't all £200m F1 teams, televised national touring car racing and sports car exotica. Sometimes, the most entertaining racing is to be found at low-key local club meets. Saturday afternoon, I got a call from a friend. "Want to go see the Speedfair tomorrow?" To be honest I'd forgotten the event - the closest thing Scotland has to a historic racing festival - was even on. Seemingly, much of the Scottish motor racing fraternity had too. Undoubtedly it was a rather more low-key affair than in previous years, when the organisers had attracted Jackie Stewart and Stirling Moss along. In terms of really great historic racing machines there was, um, a Ferrari P4 replica, a 1958 Ferrari F1 car that didn't turn a wheel because the gearbox had broke, and not a whole lot else. What made up for this was the racing. Two Pirelli Ferrari Challenge counters both proved close-fought and the Jackie Stewart Trophy Formula Ford race was equally entertaining. Highlight of the day for me, though, was the final race, for those rather odd 1930s hot-rod lookalike motorbike-engined 'Legends'. I've no idea what system is used to determine the grid, but from quite early on, it was clear that one driver was a good bit quicker than anyone else - and starting way down the field. The number 68 machine of Carol Brown was earlier on the throttle than anyone through Butchers, where I was watching, and steadily climbed up through the pack from 20th. The question was - How far would she get in the 8 laps available. By the time the last lap came around, she had made her way up to second place and was still flying. 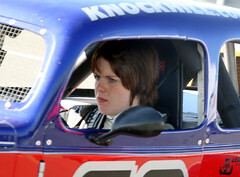 Unable to make up 2 seconds on a single lap of the short Knockhill circuit, second was where she finished. Nonetheless, of the various club races I saw over the course of the year, this was the highlight for me. Ahead of the start of the Le Mans 24 Hours this year, I had thought the only question was whether, for once, the Peugeot 908s would run reliably. It seemed clear, after qualifying, that the French machines were a good 3 or 4 seconds a lap quicker than the previously all-conquering Audis, and there was a good chance that their long winning streak might be over. With TV coverage given to Motors TV, I was left following the race via the Radio Le Mans website, and as the final hours ticked down, for once, it was still not clear whether it would be Audi or Peugeot that came out on top. In the end, it was not the unreliability of the Peugeots which let them down (although they did not run trouble free) but the fact that when the rain began to fall in the final hours, the Audis turned out to be quicker. In the dry, the Peugeots were quicker, though in race-trim their advantage was not nearly so great as it had appeared in qualifying. They were not able to run entirely trouble-free, but as the race entered its final hours, the Gene/Minassian/Villeneuve machine was within striking distance of the leading Audi of McNish/Capello/Kristensen. Had it stayed dry, the French marque just might have scored its first win since the awesome 905 Evo won in 1993. As it was, the rain enabled Audi to claim their 8th win in 9 years (9, if you accept that the Bentley EXP Speed 8 was really little more than a rebadged closed-top Audi R8). So often, Le Mans is little more than a reliability run, with the result in little doubt, barring mechanical maladies, within a few hours of the start. This year, it was a race from beginning to end, the most memorable race at La Sarthe since Toyota, Mercedes and BMW did battle in 1999.. I've always been a big fan of GP2. It has always had its problems, as a series. Most notably, it is simply too expensive for many promising young drivers coming up out of F3 to get into it in the first place. Hence F3 Euroseries Champs like Jamie Green and Paul Di Resta getting diverted into touring car racing. 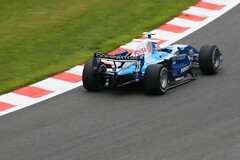 However, the racing itself has been as good as any slicks-and-wings formula of the last 20 years has produced. This year, though, GP2 didn't seem to produce quite the quality of racing that it did in its first three years (and especially in 2005 and 2006). Why? Perhaps the field wasn't of the same ultimate quality. Certainly there didn't seem to be a new Lewis Hamilton, or even a future Timo Glock or Nico Rosberg in the field. The bigger problem, though, appeared to be that the new 2008 Dallara simply can't be raced wheel-to-wheel in the same way as the old one. It appeared too sensitive to turbulent air. Nonetheless, there were some good races over the course of the year. The one that most sticks in my mind was one I sat and watched from the muddy banks of Pouhon on Sunday morning at Spa. Proving the point about how much harder overtaking was in GP2 this year, much of the race had been dominated by pole man , Jerome D'Ambrosio, much to the delight of the commentators, who thought they might have a Belgian victory on their hands. Then with a few laps to go, it began to spit with rain. Suddenly, Pastor Maldonado, the on-off Venezuelan who came alive in the second half of the season, began catching D'Ambrosio hand over fist. The only question was whether he had enough time left to do the job. On the last lap, under braking for Les Combes, we got our answer. The Piquet-Sports driver took the lead with just a couple of miles to go. A similar plot would play out in the Grand Prix come the afternoon, between Hamilton and Raikkonen, but I have chosen the GP2 race because unlike the F1 race, it wasn't tainted by the nonsense that followed in the stewards' office. How often do we get a really unexpected result in Formula 1? Once every few years at most. When it became clear that qualifying at Monza would be wet, I remember asking of the Atlas F1 Board "What price a Toro Rosso on the front row?". I didn't expect that Sebastien Vettel would actually win the race though. Far less, that he would do so without needing the intervention of safety cars, without all the expected front-runners eliminating themselves, but simply by driving away into the distance in the manner of Ayrton Senna at Portugal in a Lotus 97T, all those years ago (as it happens, the very first race I ever saw on television). For me the race stands out not for the on-track action, though there was plenty of it further down the field as Lewis Hamilton, in particular, tried to make amends for a disastrous qualifying session, but for the way in which a young, inexperienced driver in a relatively unfancied car simply proved faster than anyone else on the day. Past 'surprise' victories, such as Olivier Panis' win at Monaco in 1996 or Johnny Herbert's final victory for Stewart in 1999 relied on heavy attrition and a large dose of luck. Vettel might have been helped a little by the poor qualifying performances of Messrs Raikkonen, Massa and Hamilton, but there can be little doubting that this was a convincing victory, and for me, a real highlight in what was at times a rather poisonous and rancorous year for Formula 1.